Energy solutions and energy technologies are globally the biggest growing market of the 21st century. Mission Innovation brings together 23 governments worldwide and the European Union taking the lead in accelerating the global clean energy transition. This public-public-private partnership will stimulate technology markets of new dimensions and with high dynamic. The Austrian government will together with the Austrian industry actively contribute to the goals of Mission Innovation. With the governmental programme 2018-2022 Austria commits to international climate goals and sets itself even high ambitious goal, such as 100% renewables in the power sector by 2030. Since 2008 Austria could more than quadruple its public energy research expenditures and has reached a level of about 140 Mio €/year. The governmental programme attests that energy research will be intensified, and mention a new energy research offensive, which is currently under preparation. A strong focus will be on batteries, storage and hydrogen, digital and smart systems. Research, Development and Innovation also plays a central role in the Austrian climate and energy strategy (to be finalised in June 2018). Besides the continuation of mission oriented RDI programmes on “plus energy areas”, “integrated regional energy systems”, “break-through technologies for industry” and “efficient mobility systems” the programme “Mission Innovation Austria” is foreseen. It builds on the programme “Flagship region energy” and focus on large field tests and real life laboratories for energy model regions. Austria intends to join MI Innovation Challenges and be actively engaged in the group work. There is interest from the Austrian Government, research organisations and the Austrian Industry to actively contribute to the mission innovation challenges. Particularly we are planning for an active participation in the challenges 1) Smart Grids and 7) Affordable Heating and Cooling in Buildings. For the Challenges 2) Off Grid, 4) Sustainable Biofuels, 5) Converting Sunlight, 6) Clean Energy Materials we are at the moment further consulting with research and industry organisations. Furthermore there is a high interest on the topics of batteries and hydrogen. Austria would be committed to help leveraging on synergies with existing management structures in order to support the work of MI challenges. Austria would be interested in the work of the sub-groups (Business Investor Engagement, Analysis and Joint Roadmapping). A key for success in Mission Innovation is the strong Public-Private Cooperation. Austria has installed a national governance structure, ensuring a broad involvement of Austrian industry and RDI stakeholders. The Expert Advisory board, chaired by Wolfgang Hesoun (CEO of Siemens Austria AG) gives strategic advice. 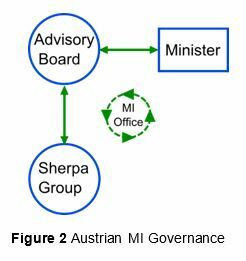 A Sherpa Group supports the expert advisory board by collecting information from the Austrian innovation system (e.g. funding agencies and programmes, technology platforms and associations, Austrian Economic Chambers,…). It will also disseminate the Mission Innovation progress and results in Austria. The Mission Innovation Austria initiative will be coordinated by an Austrian Mission Innovation Office, based at the Austrian Institute of Technology (AIT). The baseline is calculated by averaging the budget for project funding of the Flagship Projects in the national programmes for energy research. On average 16 M EUR of funding have been granted each year between 2014 and 2016 for flagship projects. In the past, numerous Flagship Projects have been funded within the portfolio of the above mentioned national programmes for energy research. Now a new program has been started, which bundles a number of flagship kind projects in “Flagship Regions for Energy”. The new programme “Flagship Region Energy” will increase clean energy innovation by funding three flagship regions with a max. 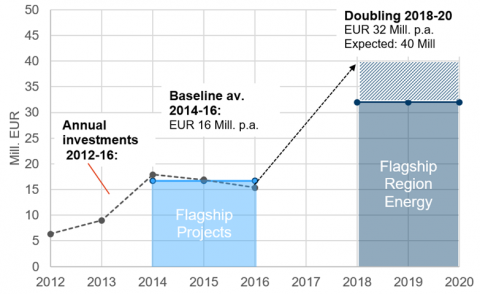 budget of EUR 120 mill within three years. Therefore, doubling will be reached between 2018 and 2020. On average, this results in at least 20 M EUR per year additional funding between 2018 and 2020. Detailed explanation about flagship projects and the “flagship region programme” can be found in the full document “Country Rationale and Baseline for Austria”.